Not a China-built sofa as far as the eye can see. Other retailers will give you glamour shots in spectacular rooms. 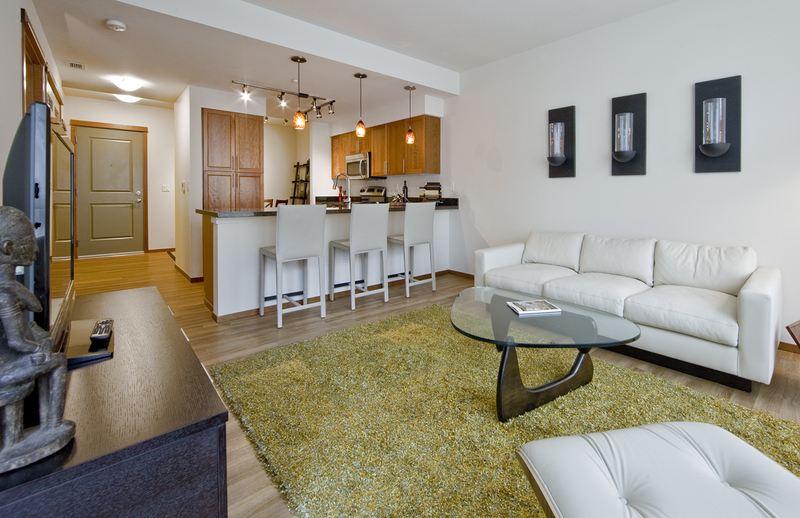 Rugs, lighting, 20 foot ceilings, and professional photography can make even an average sofa look like a million. Here at couch though I prefer to let the sofas shine. This world class english rollarm appears in its home, our South Central LA factory. The cover on it is the inimitable “Brompton” Italian leather from Moore and Giles. The foam on it is commercial grade 3lb per cubic foot foam (as opposed to 1.8lb pcf foam used by CB or PB) – same foam you’d find in a hotel lobby. The upholsterer in the background makes $15hr and drives home in a pickup. 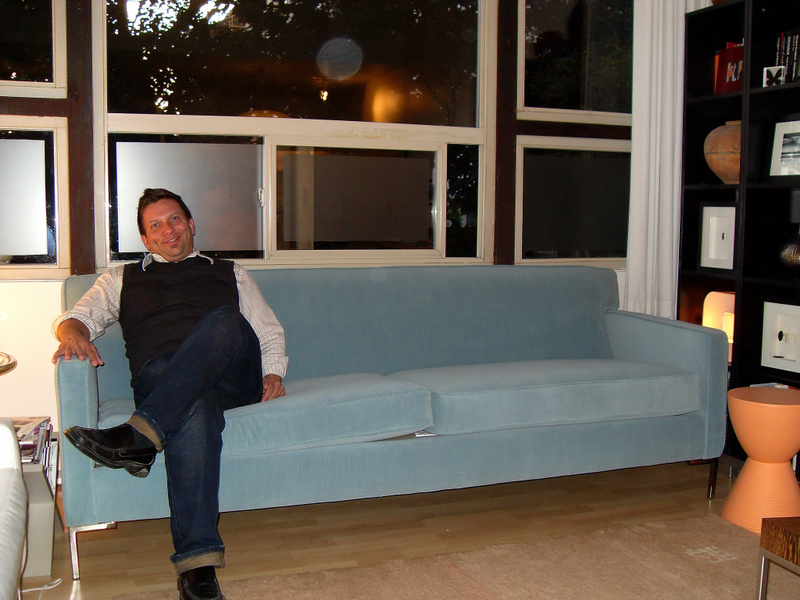 I’m so very proud of this sofa, the materials used to make it, and the guys with the skills and knowhow to put it together. 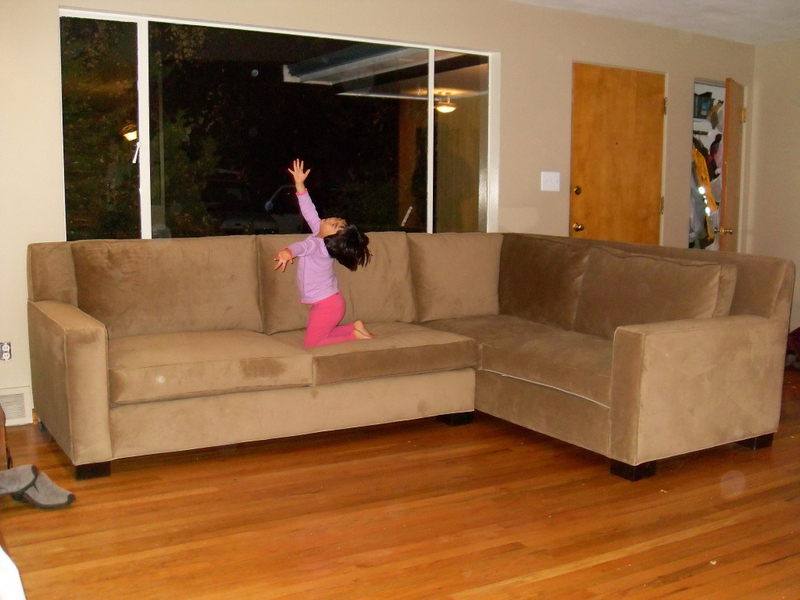 All this talk of double dip recessions has scared us here at COUCH. And although COUCH was opened two years ago in the midst of the great recession we feel that a single dip was more than enough. So here’s our recession deal. 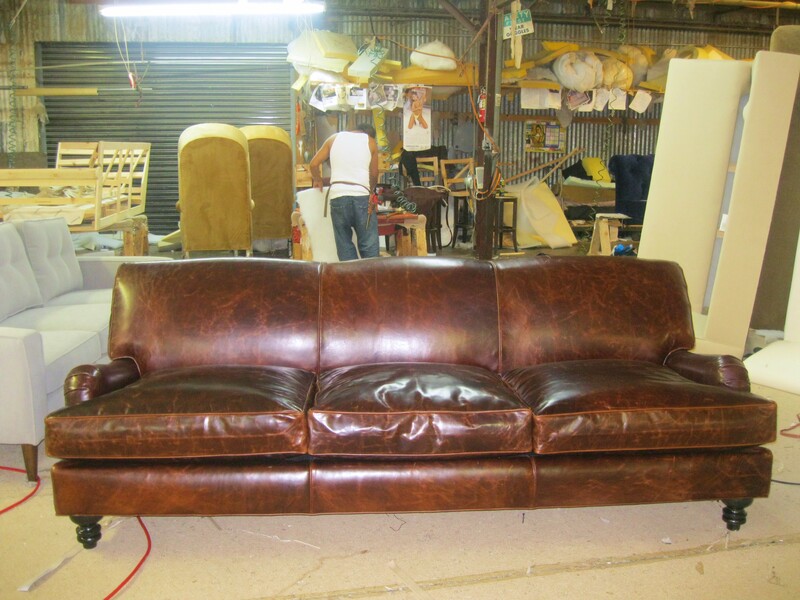 A Los Angeles built sofa with a wood base and a feather seat and button detail on the seat and back. This isn’t the only sofa in town for $1200 but it’s quite probably the best. 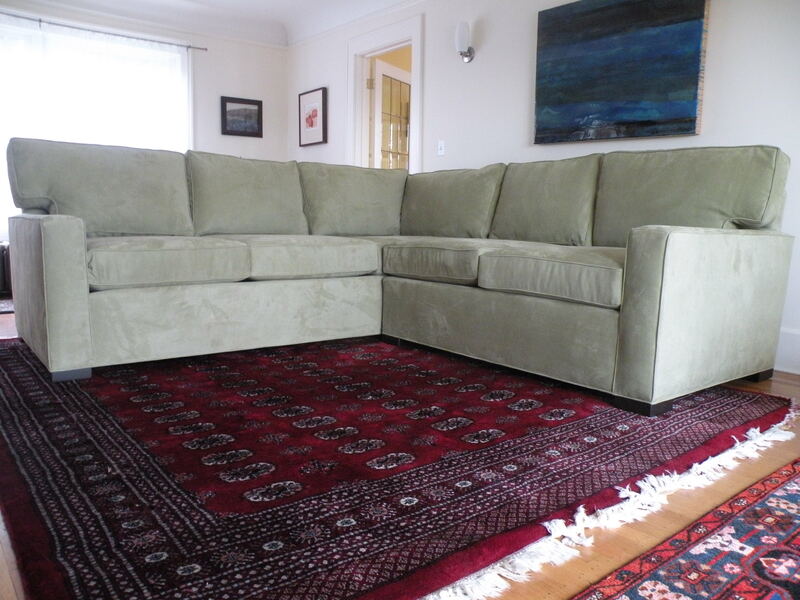 There’s simply not another US built sofa with seams this straight and a feather seat for anywhere near the price. Shop ALL our competitors. Lift some seat cushions up to see how heavy the foam is. Pinch some back cushions up to see if the manufacturer could have perhaps filled them with fiber at a higher pressure. Observe the seams to see how straight they are. Go where you might, but $1200 for this one as shown will not be beat. And the best part is that this frame is part or our quick ship program- meaning you can have it in less than a month. 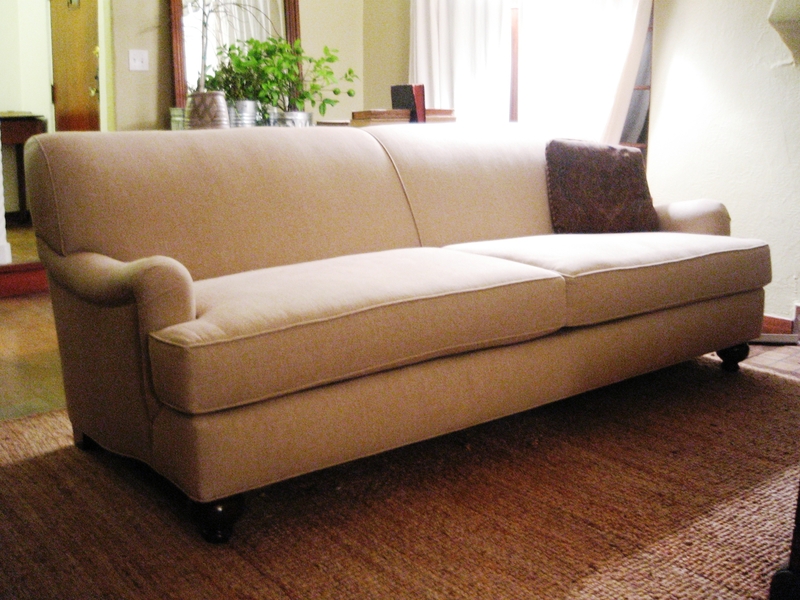 Shown here at 75″ apartment size, our Holland has emerged as a COUCH top seller. 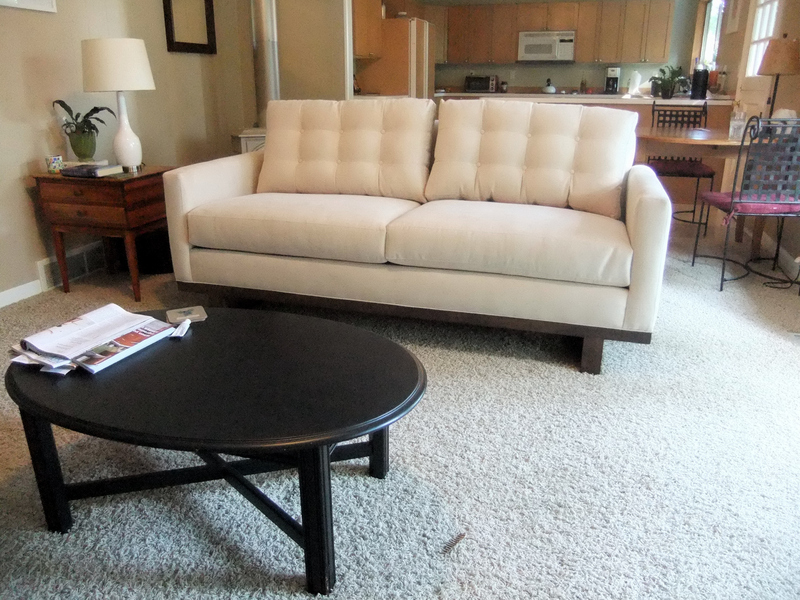 With updated mid-century styling and an exclusive wraparound wood base, it’s styling is simply perfected. I’m an obsessive sofa tweaker– and in this case, I wouldn’t change a thing. I love clients like Will and Brian of Columbia City. They had a very basic guidance for me saying they liked a traditional look but couldn’t stomach prices at the Design Center where so much of the good traditional stuff is found. 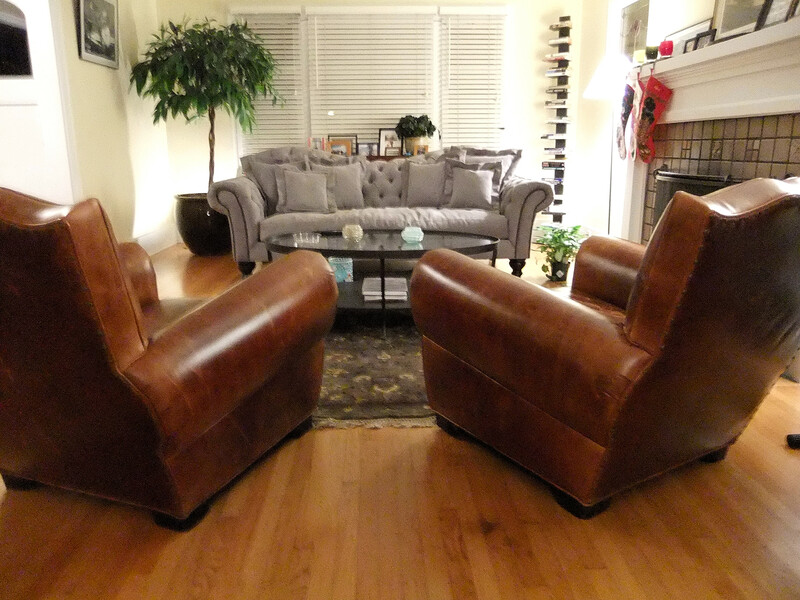 In a short home consult we decided that we could just barely fit the very high end looking reverse camelback chesterfield pictured. 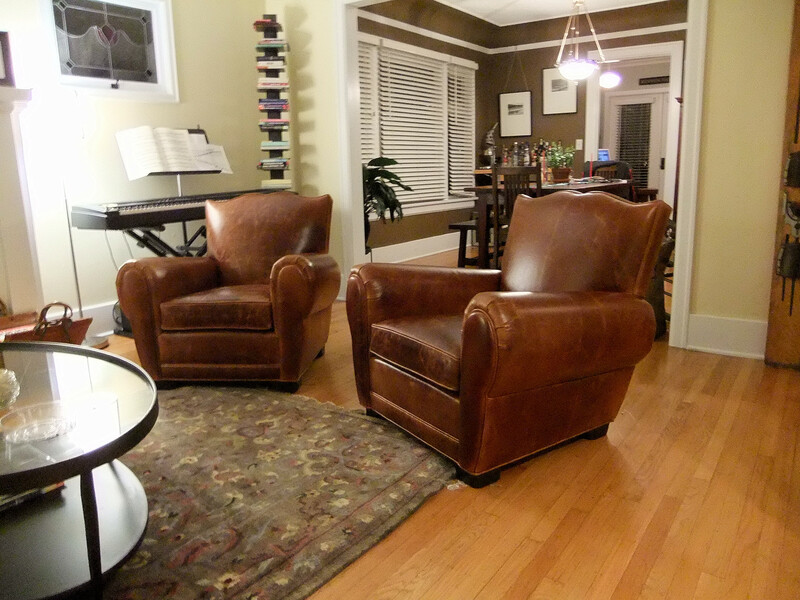 They came back a few weeks later when the budget allowed and agreed to let me make them replicas of a 90 year old french mustache top club chair from an antiques website. With subtle details such as the nail heads on the back and the seam cutting the front rail (the area between the seat and the floor) the chairs were a knockout and subtly echoed the dip in the middle of the sofa. Nothing is more satisfying for me than getting clients an Elle Decor look at Crete and Barrel price point and I couldn’t be prouder of this room. This is me putting together what industry types call a “vignette”. I need to put a plant, coffee table, and a lamp to complete the scene, but this ain’t a bad start. 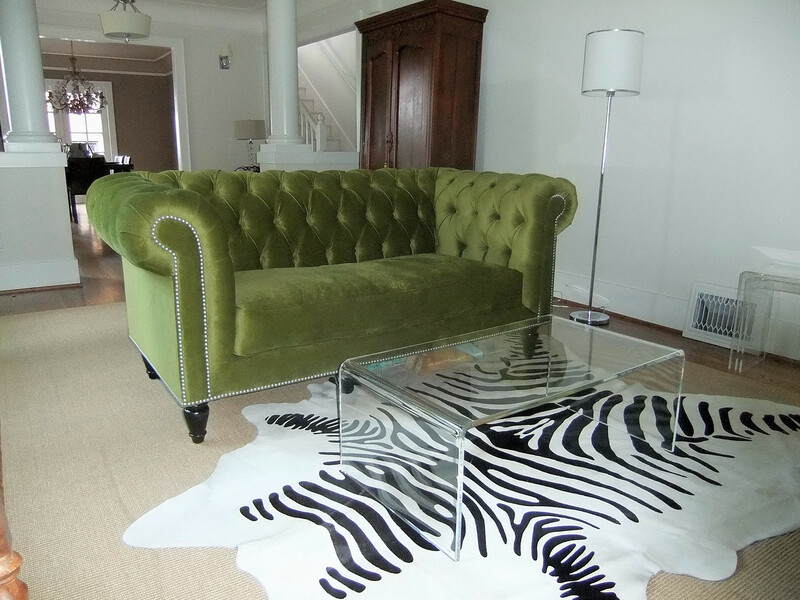 This “earth” colored Chesterfield looked FABULOUS on the zebra rug. Chesterfields are a classic, and surprisingly versatile. While they’re a highly traditional piece, I’ve seen them work well in decors from traditional, to the glamour of Hollywood Regency, and can even work as a little extra spice in a minimalist loft. 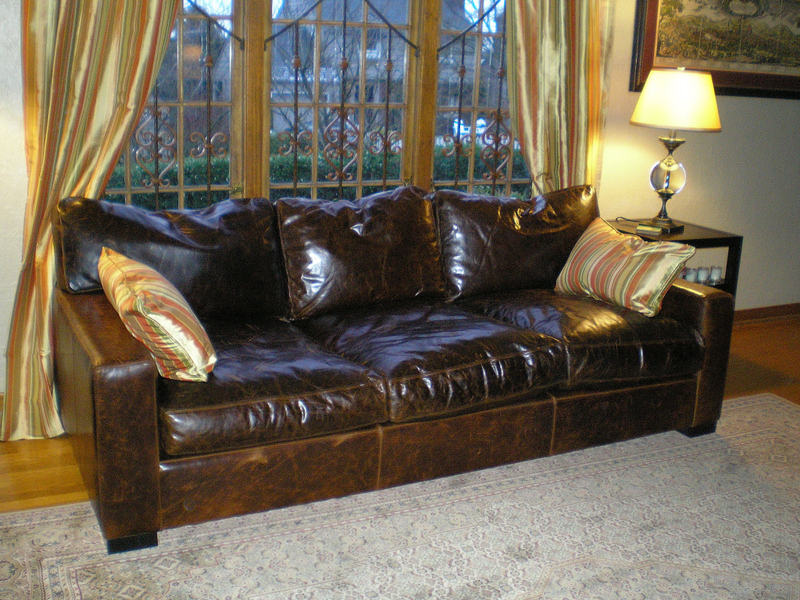 No one does a Chesterfield quite like COUCH. 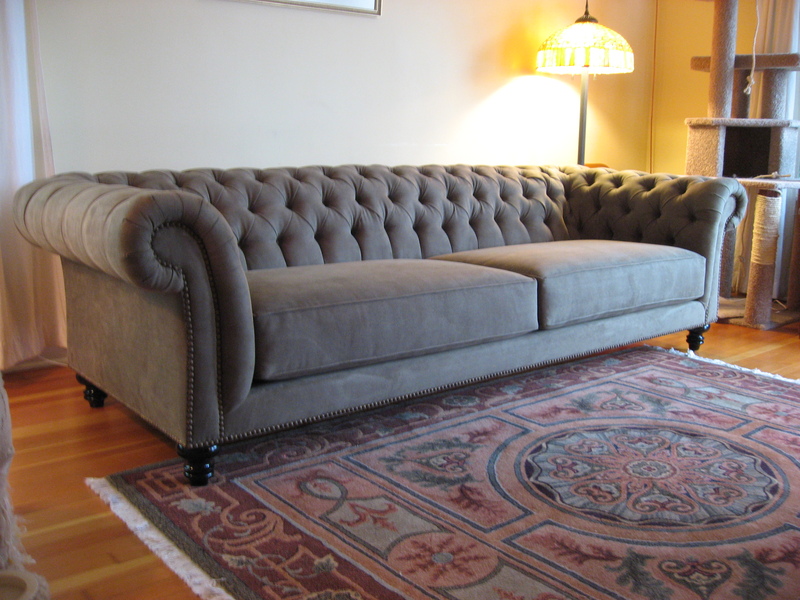 The diamond tufting that defines the chesterfield style is so difficult that most industry players don’t bother. You see, quality control becomes a nightmare in mass production at this difficulty level because only a select group of upholsterers can be taught to do this (seriously– there’s only two guys out of 23 career furniture makers at my factory that can upholster this frame). Certainly no one else does Chesters at custom sizes because that makes it exponentially more difficult. On this frame that went to proud Ballard owners the thin front rail accentuates the THICK seat cushions for an updated play on a traditional theme. 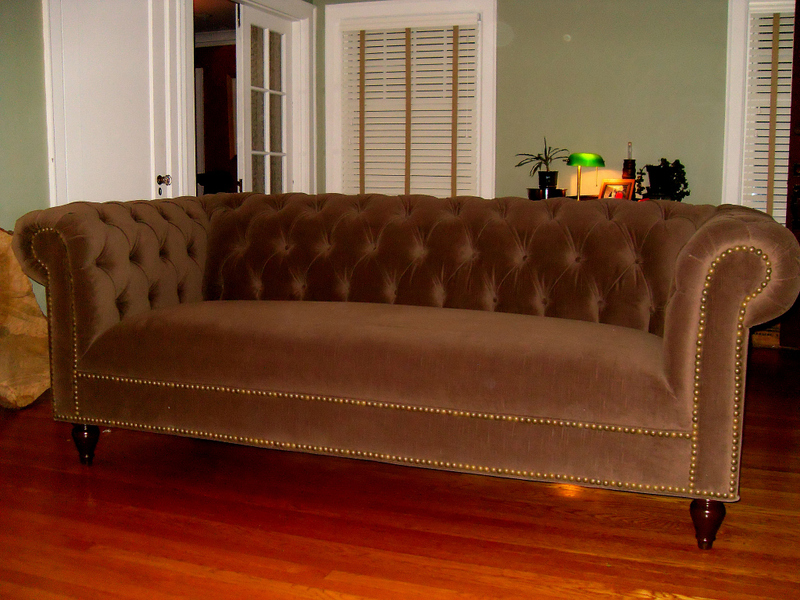 This 108″ deluxe sofa with custom carved nail heads was breathtaking. If you think this one looks a little bit “heavy” but can’t place what it is– here’s the secret. The client on this one was 6’6″ and had some knee problems. So we had to raise the seat height from the standard 17.5″ to a little over 20″. The “kiwi” colored microfiber and top-notch detail work took a simple track arm Mawell and made it into something fantastic. A rather unique play on a chesterfield- which almost always has large rolled arms. High sheen velvet, high polish nail heads, and a wooden base. 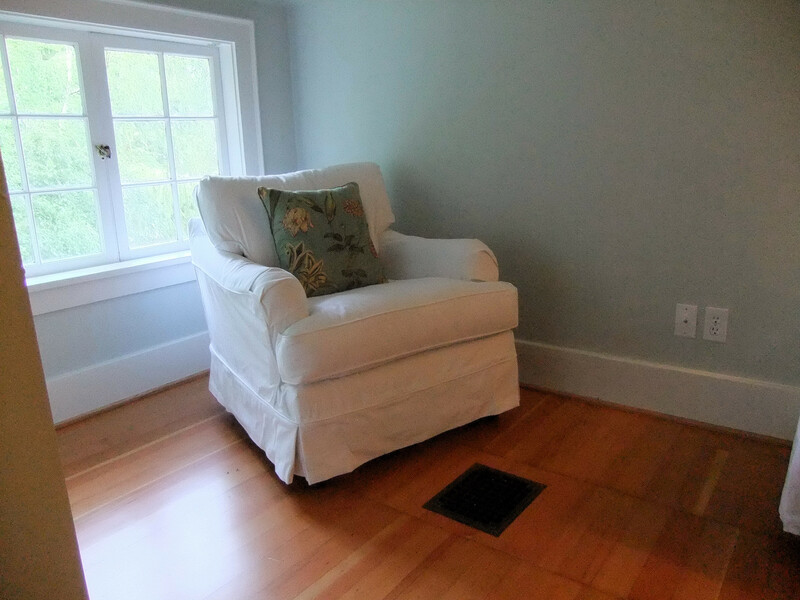 The “parlor” of this Queen Anne home was very happy with this new addition. With polished nickel nail heads and a bright “apple” colored velvet this piece shone bright in a wonderfully updated house in Rainier. Brompton Cocoa – our best selling leather. Incredibly high grade leather featuring the ever popular Brompton Cocoa leather from Moore and Giles. Featuring optional 8 way hand tied suspensions and simple, stately frames with impeccable detailing and down seats and backs– our basic roll arm and track arm sofas are pretty darned close to perfect. Modern lines paired with mid century legs. A deep seat and sink in down seats and backs. A butter soft ivory leather. World class finish quality. Los Angeles production. Simple, simple, things- that for some reason are exceedingly difficult to find. Depending on where you go the style of arm featured below is called a “Charles of London”, a “Saddle” or simply an “English” arm. It’s elegant, ever so slightly feminine, and can take a piece from good to great in a heartbeat. Shown in a very natural looking linen/viscose blend, this 90″ beauty was an instant centerpiece in a beautiful, eclectic, rental house in Ravenna. I LOVE people who live well in their rentals. You only live once people– and if you keep waiting till you have your own place to buy “real” furniture– you could be waiting years sitting on a frat house sofa looking at creamy puke colored paint in a blinding high gloss with interrogation lighting flooding out of a 1974 fixture. Take a weekend, paint your damn living room a color you like (tell the landlord you’ll paint it back to puke before you leave). Drop $200 on a couple of nice floor lamps from JC Penney (whoever puts their lighting collection together is my hero) and check out their collection of wall art too. We are profoundly affected by what’s around us, and waiting for a vague “later” to surround yourself with pretty things that make you happy just makes NO sense. Mix one part English arm and one part tufting and you’ve got a sofa VERY few builders will approach. The level of skill in tufting and geometry this masterpiece displays simply isn’t taught in Upholstery 101. 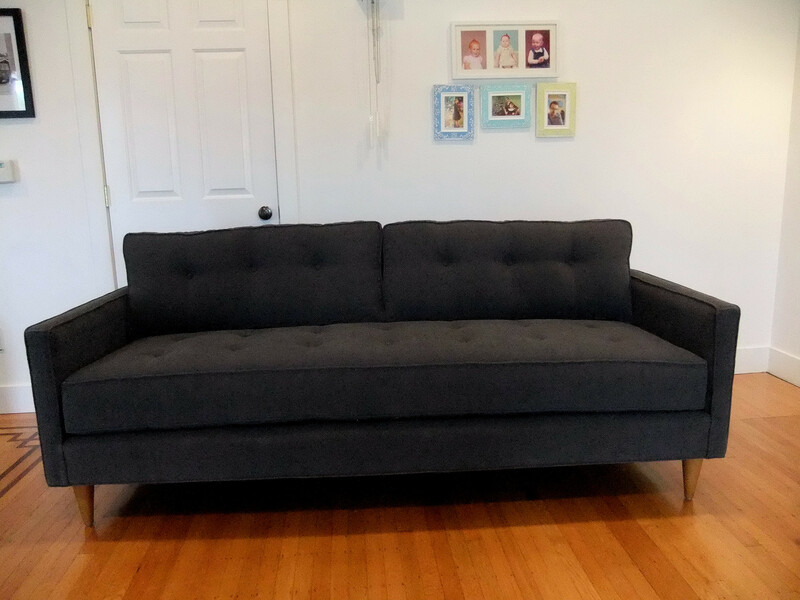 Show me one other store in the city that can build this sofa to an exact size (75″ in this case) for less than 5k and I’ll hand you a crisp Benjamin with no questions asked. If you’re thinking this photo is a little nicer than my others that’s because I didn’t take it. It’s part of the promotional package for the SWEET housing complex at the “77 Central” on Mercer Island. The developer wanted nothing but the best for his show unit. 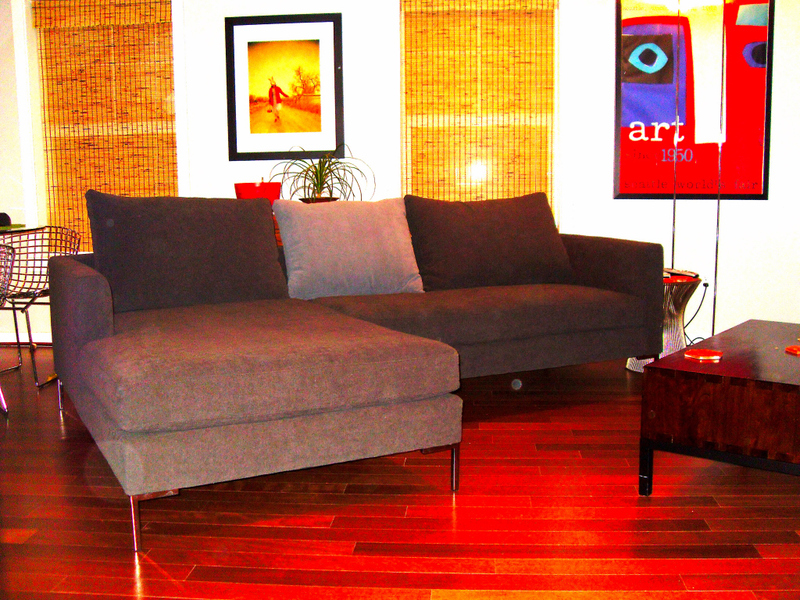 A $4,500 original Eames Lounger graces the foreground and an original Noguchi table sits in front of my “deep” sofa. With SOFT italian leather and sink in feather seating over a recessed base which lends a floating effect, this sleek sofa looks right at home in a room full of icons. Nothing but the best indeed. This is my finest photo. Looks just like it belongs in a catalog. EXCEPT FOR THE DARNED BOTTLE IN THE FOREGROUND!!! On to the sofa…. Shown in a HIGHLY textured fabric with threads of blue, brown, orange and green in it, this pared down pure mid century piece is a COUCH original. 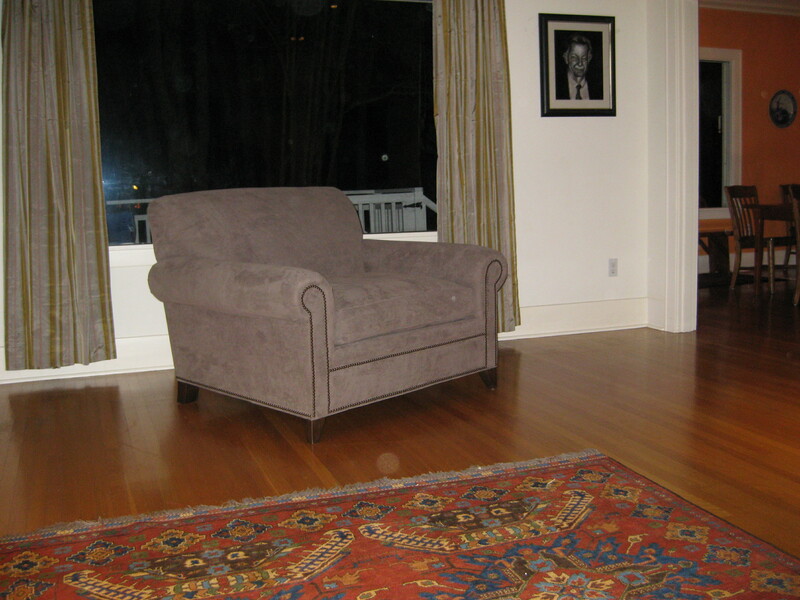 It always amazes me how seemingly tiny changes to a sofa COMPLETELY change its character. This, believe it or not, is the same frame as the one above it. All that was changed was the wooden base and the addition of buttons on the back, and voila, a mid-century purist was updated into a transitional beauty. Kelly of Capitol Hill rolls stylish. 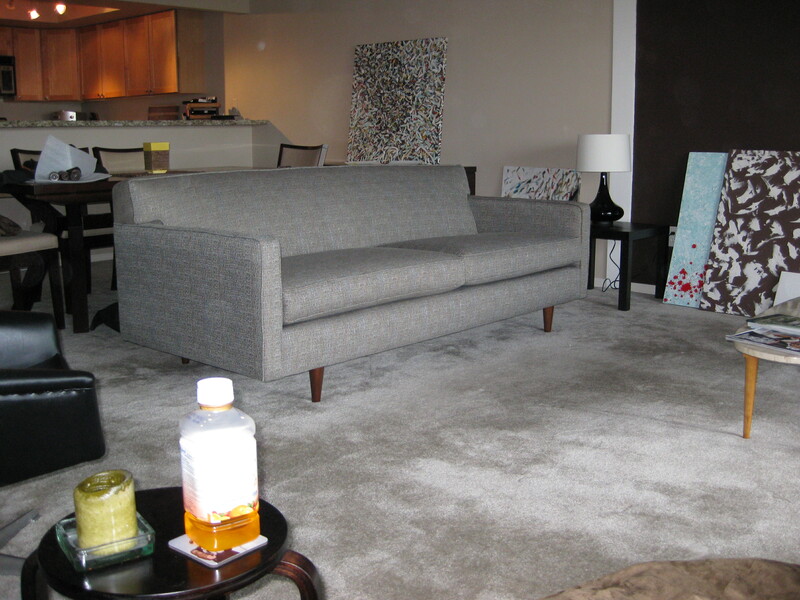 In an uber-trendy condo with blonde hardwoods and 16 foot ceilings my sofa looks right at home. I like it a lot. Incidentally, this is the same frame as the two above it- but shown in chrome legs. Crazy how swapping out a small detail can affect the personality of a piece so much. Couches to suit your style. 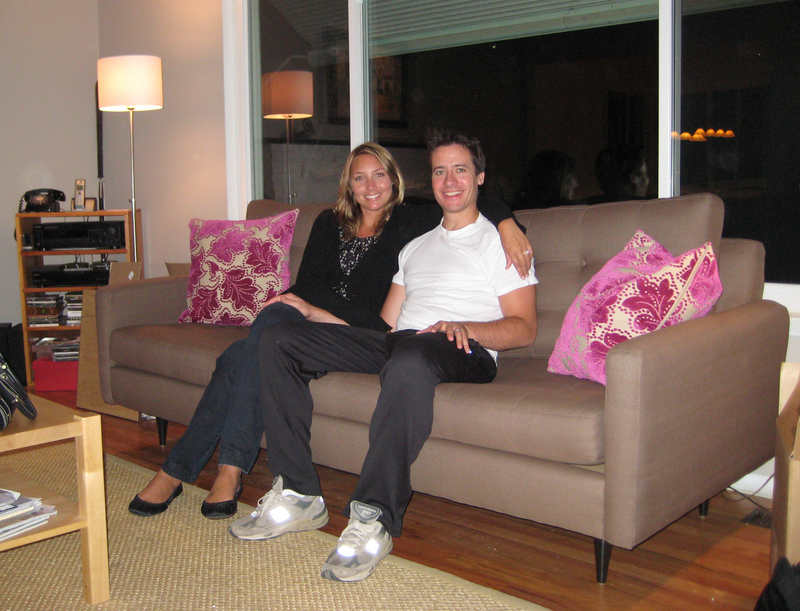 Chris and Monika of Cap Hill wanted a Gothic couch. This 104″ beauty (fitting in between their bookcases perfectly) came in two 52″ pieces to fit through their narrow hallways. 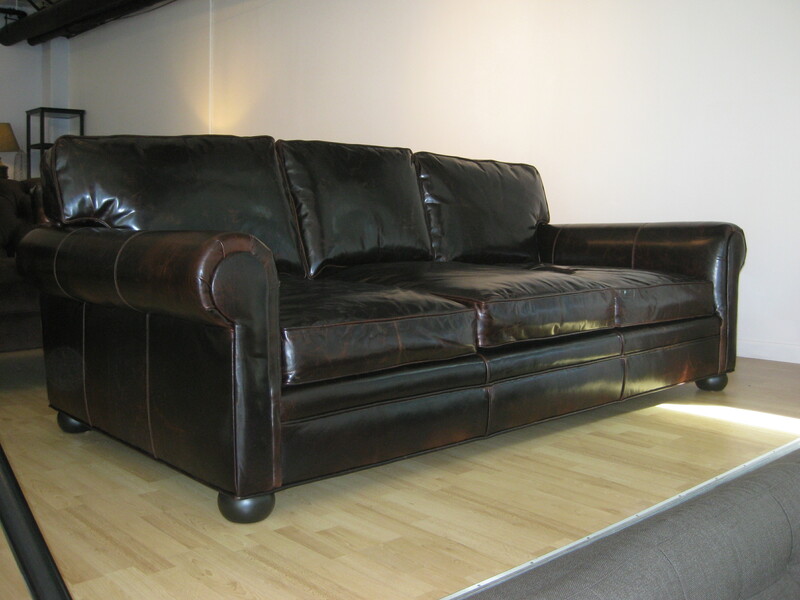 Shown in a THICK Brompton black leather and with high polish silver nailheads, this is yet another sofa that no other store in the city would take on. 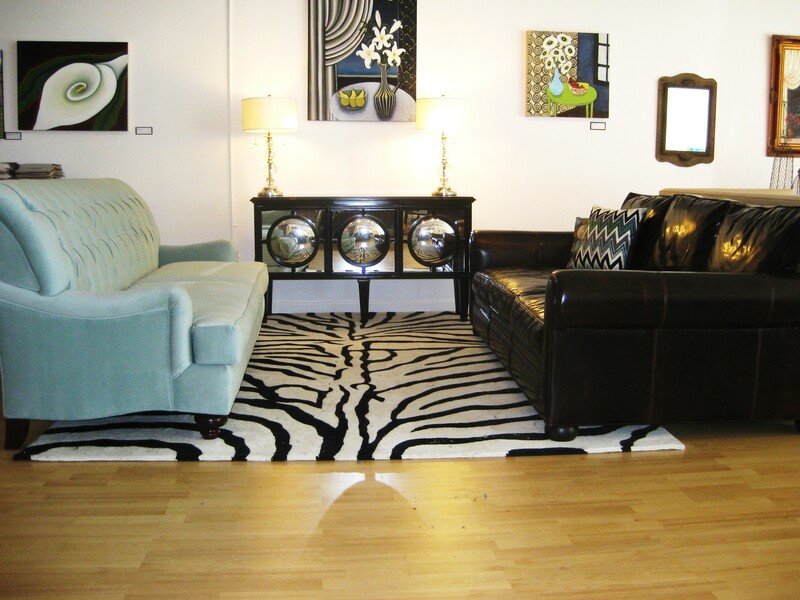 Seriously, imagine walking into a furniture store in the U-Village and saying you want a “Gothic” couch. You might get laughed off and you might get arrested, but you wouldn’t get a Gothic couch. After all that reading it was sleepytime. This is the first bed that COUCH has delivered and I was dead pleased with the result. Sue of Westlake went high end all the way. 100% linen fabric in a bold blue. Down in the seat and back. Contrast nailheads on the inside arm and a dog from the Ralph Lauren catalog. Notice how the arm is thinner towards the back and increases in size towards the front A piece like this simply can’t be had at a standard retailer- and the design center would charge you roughly 3x what Sue paid. The production difficulty level on this couch is roughly 13 on a scale of 1 to 10. The legs are 10″ so have to be built into the frame or they’d break off. 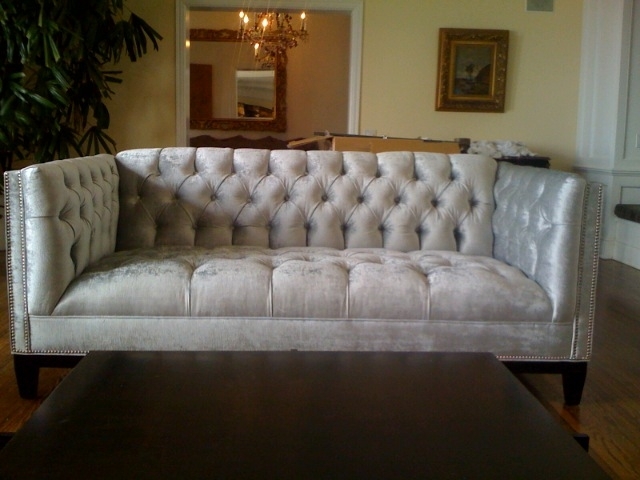 The diamond tufting on such a boxy piece isn’t a walk in the park either. 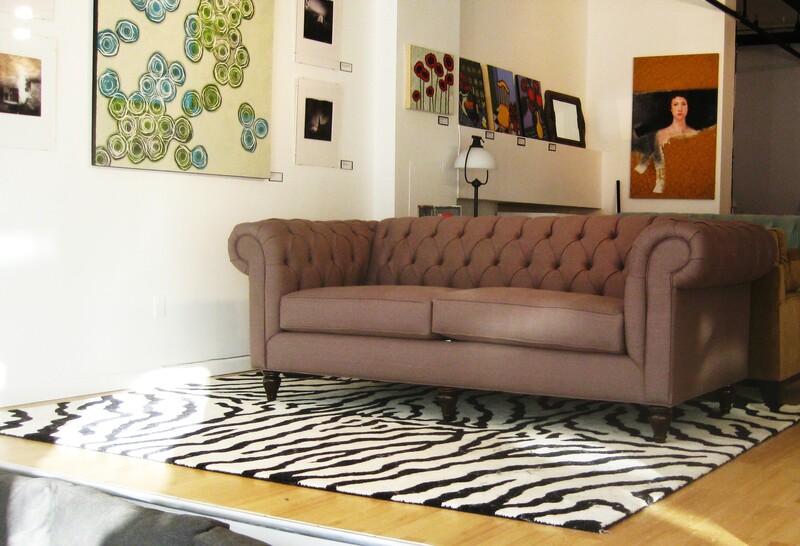 The finished effect is stunning though– and is another sofa that no other store in Seattle would attempt. Deborah of Lake City wanted a simple sofa for her front room that would be formal enough for guests but cozy enough for her. 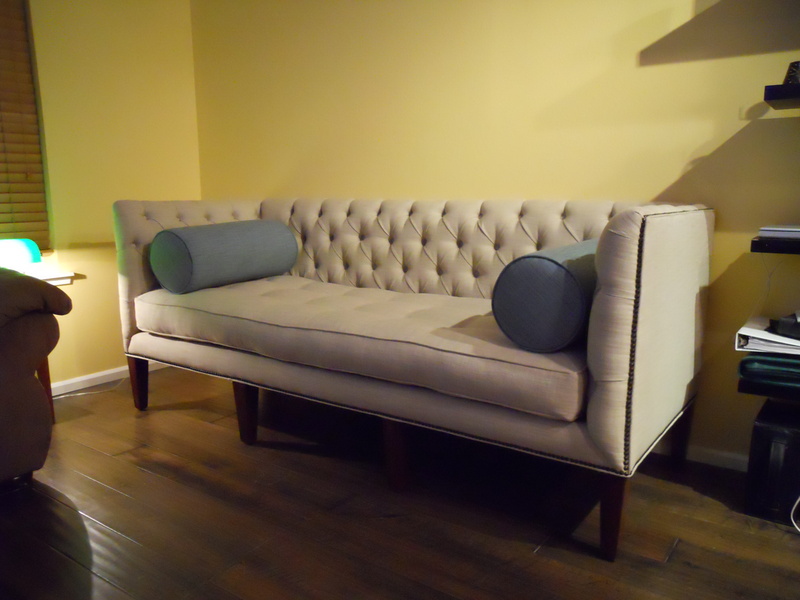 This is an extremely simple tight back sofa- but the addition of the bolster pillows and the three buttons on either side of the center back seam made Deborah so very pleased. I LOVE simple. No tufts, no chrome, no fancy dancin’. Just good old fashioned square armed (track arm in industry parlance) couchin’. 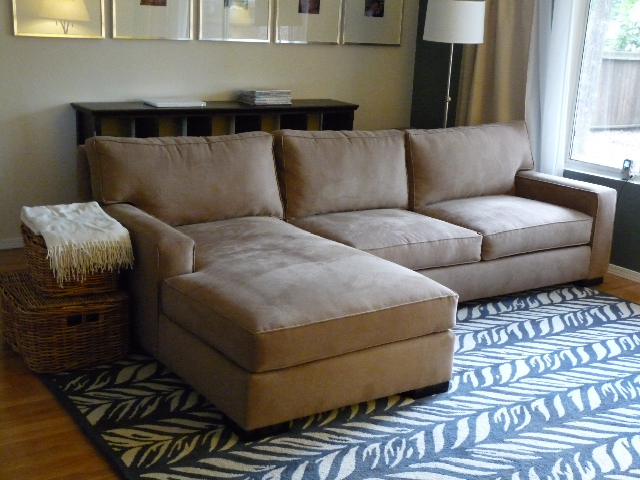 110″ across the back and in a kid friendly microsuede, Casey and Steph of Redmond scored. 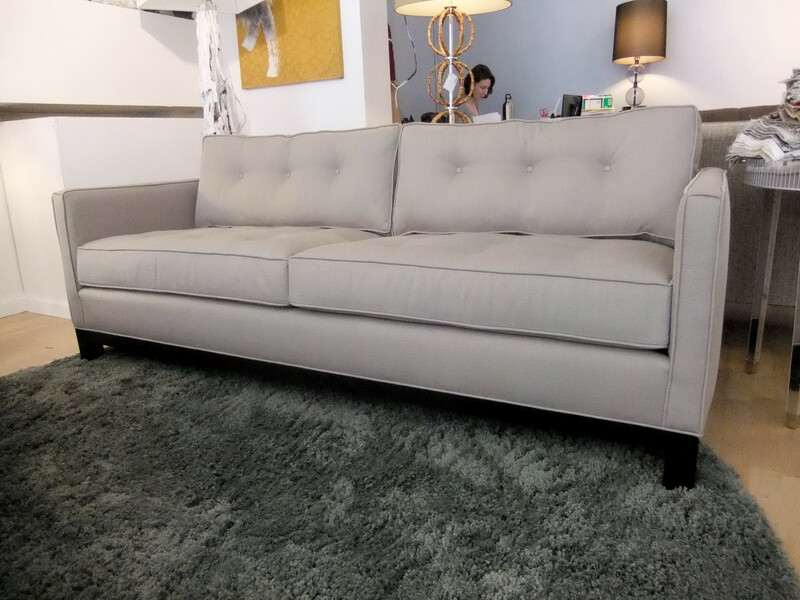 An uber comfortable mid-century inspired sofa featuring impeccable tailoring, a soft faux-wool fabric, and a bench seat. I REALLY enjoyed delivering it too. The family obviously loved it and the baby had drooled it (no worries, it’s a durable fabric) before I even got done taking pictures. Awesome. Jacquie and Josh of Kent are cool-type people with excellent taste in TV shows. Josh does execy type stuff for a Seattle coffee giant and came to me after realizing that though he could afford the $5,500 that Ethan Allen wanted for a sectional VERY similar to this one he’d really rather put the $2500 difference towards, ya know, stuff one can buy for $2500, which is a fair bit of stuff. Jacquie and Josh have the record for latest delivery as well. It was no earlier than 11:45pm on a cold and rainy night before I rolled up in “Big Buck”, my uber-creepy trooper of a delivery van. Chris of Medina wanted a “Mid-Century Northwestern” aesthetic, and let me say, he knows what he’s talking about. The chair peaking out on the left is a danish masterpiece from the 60s and worth a fair bit more than the price of the sectional. Shown in a hardwearing textured poly-blend, “mid-century Northwestern was achieved! 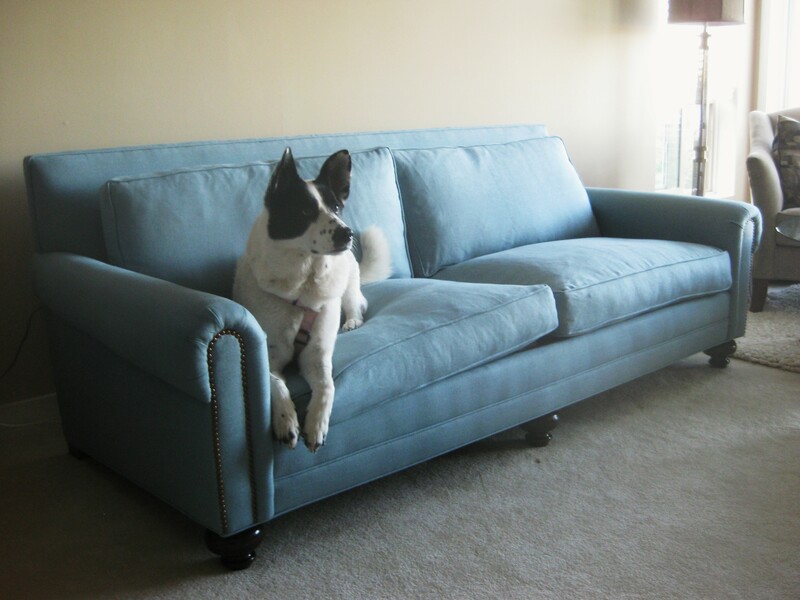 Kaya seems to like the sectional her parents chose. Perhaps it’s the butter soft yet highly durable velvet that’s making her so happy. Perhaps it’s that it’s exactly 118″ by 84″ inches to EXACTLY fit the space it needed to fill. Perhaps it’s the feathers in the back and seat giving an ultra-plush seat. Perhaps it’s the super high back (raised in order to be more supportive of her dad’s back problems) Perhaps it’s the elegant track arms. I don’t know what it was exactly that caused this munchkin from North Seattle to be so happy, but at Couch we have a strict policy against questioning the happiness of munchkins. We just go with it. An updated mid-century piece with slim track arms and a creamy cotton fabric. 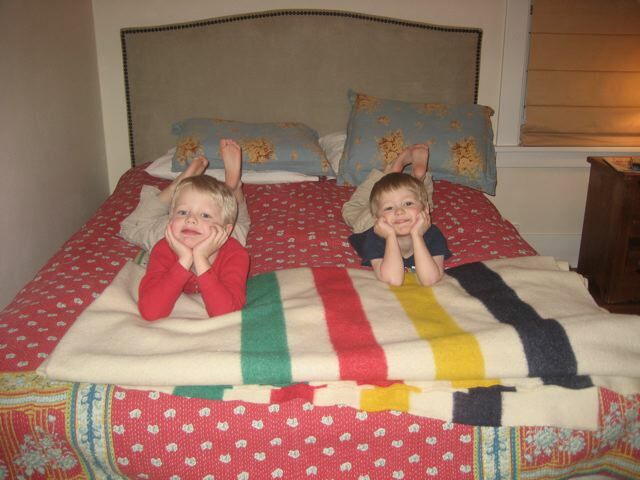 More happy customers. 100″ across the back total for reference. There really is something about white denim. It’s not as soft as velvet or as showy as stain resistant as microsuede. But something about the natural fiber makes it feel just like home. The sink in feather fill and loose slipcover made this chair a welcome addition to Jenn’s bedroom. Exactly what the client wants. 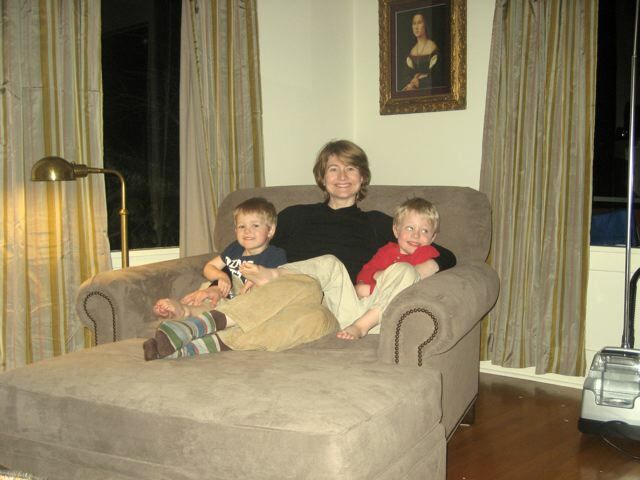 Michelle of Lake Forest Park promised herself a sofa when she got her PHD. She wanted something super casual, in a super soft fabric, with “LOTS” of loose back cushions, and with one of those seats you sink into. I told her I didn’t like the chenille she liked. I told her the center section had to be longer than it was or the piece would look terrible. 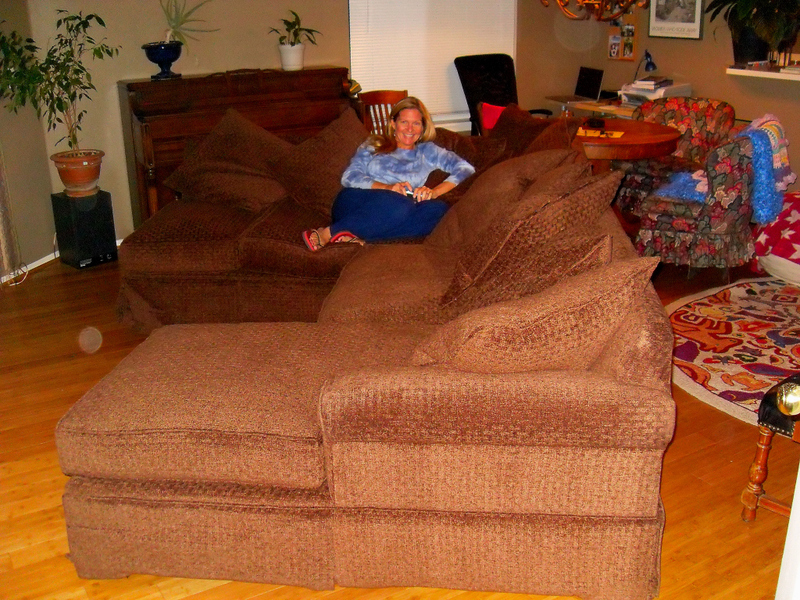 I encouraged her to get fitted back pillows rather than the “scatterback” configuration she chose. I told her to do lots of things she didn’t do. Score one for Michelle and zero for Couchguy: it looked fantastic. Eli of Sand Point is a brand new dad. Observe the mini-munchkin in the background. 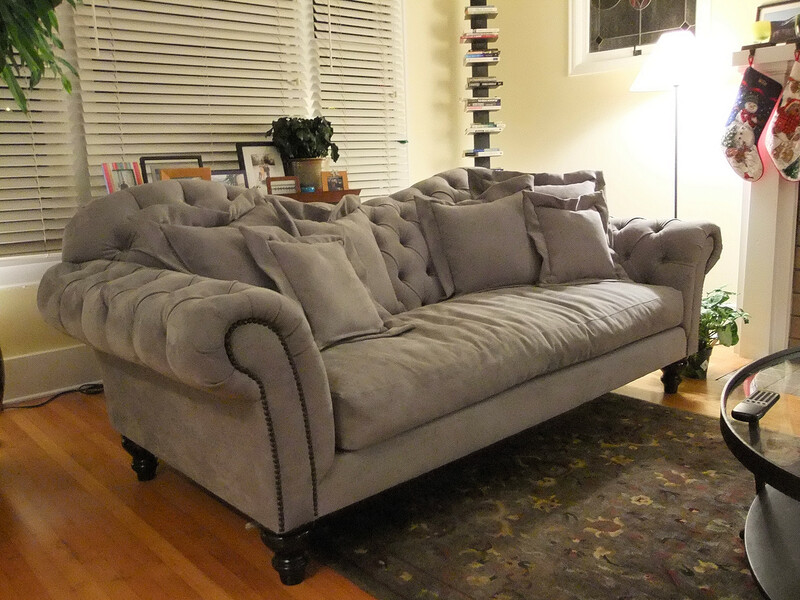 I had to be extra quiet taking the picture but I think it turned out OK. Eli liked the look of the Restoration Hardware Maxwell, but didn’t want it 46″ deep since that would have eaten up simply too much floor space in a relatively narrow room. He got a pair of Maxwell’s that were reduced to 42″ in depth. Yet more sofas that simply can’t be had anywhere else. Yay COUCH. 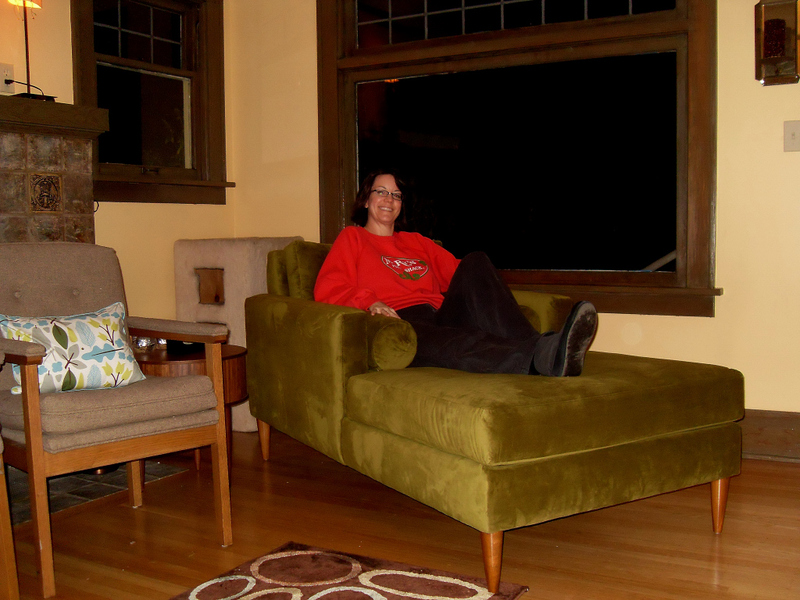 Kristi of Fremont wanted a mid-century inspired reading chaise with POP! Shown in a plush apple colored velvet, it fits her like a glove. The velvet isn’t only comfortable, but doesn’t tempt Kristi’s kitties who like to dig their claws into rougher fabrics. The bolster pillows make a perfect place for her to set her elbows for late nights with thick books. Purpose built details like that simply can’t be had at the big retailers. 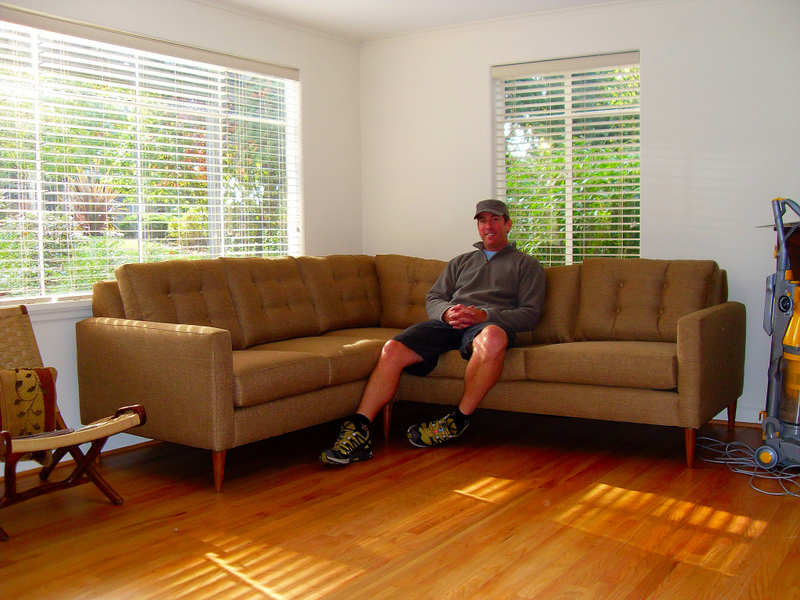 Jason (and his wife whose name I can’t quite place)of Mercer Isle needed a comfortable sectional large enough to recuperate on after long days on the slopes but small enough to not close off their family room. They liked the look of the “Axis” from Crate and Barrel but it didn’t come in the right size, and at 43″ it was a touch too deep. The 90×90 shown features the same herringbone fabric CB uses but has been reduced in depth to 40″. It also features Trillium– which is a REVELATION. It’s a new gel based compound that sits as plush as a 50% down/50% feather blend. Imagine sitting and sinking for about 5 seconds while the cushion hugs your bottom. Another FULLY custom piece. 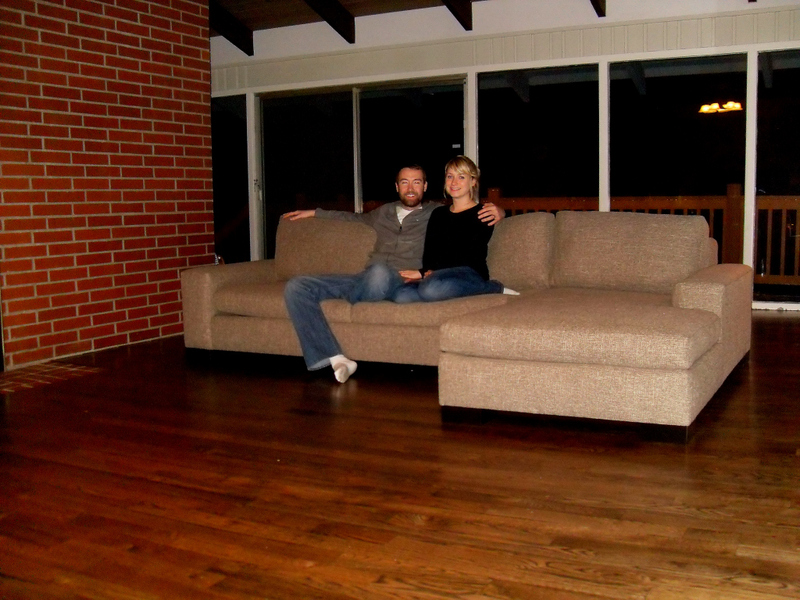 Megan of North Seattle spent $2720 on this. It looked JUST right, fits their space perfectly and was obviously a HIGH grade sectional as soon as it came out of the wrapping. Truly RIDICULOUS seating here. I’ll have to order one for my showroom. 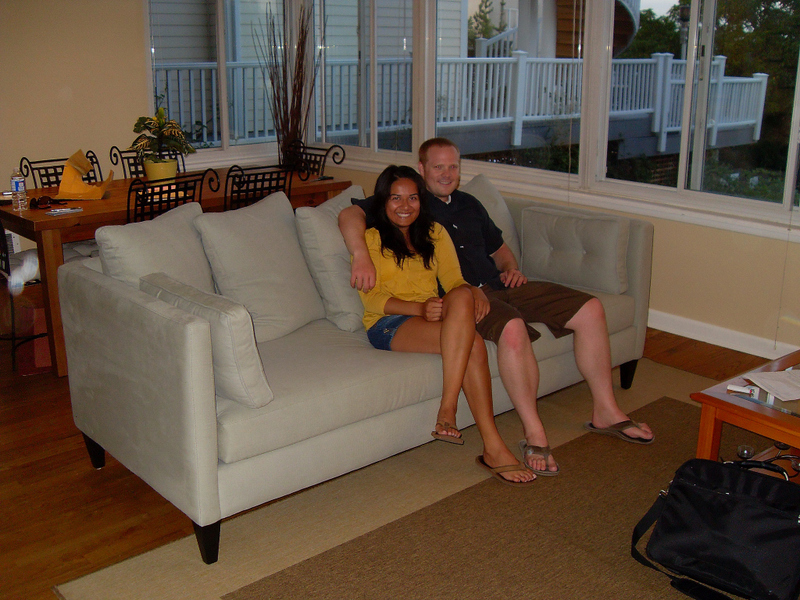 Newlyweds Todd and Erica of Queen Anne smiling on their brand new lounger. 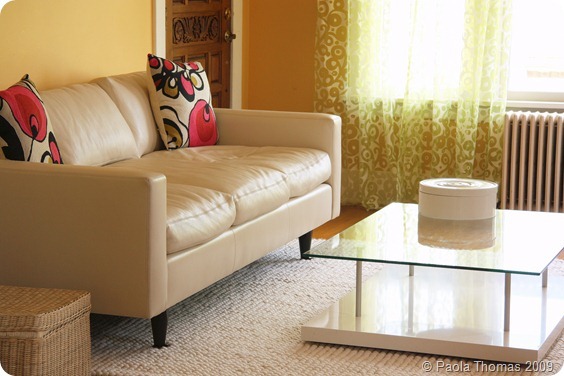 Erica was eyeing this sofa (the Cannes style) for years at Crate and Barrel- and when she finally set the money aside she found they’d discontinued the style. There’s no such thing as “discontinued” at Couch. 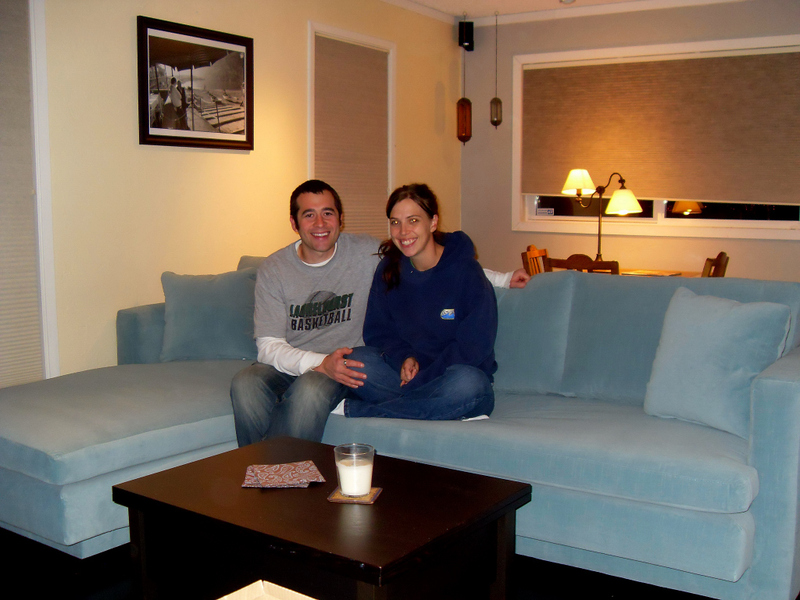 Zach of Ballard wanted a sofa that wouldn’t sink into the background. The scarlet velvet and martini-glass arms got the job done! Chad and Chris of Queen Anne work in the design field and are new to Seattle. They’re putting together a house full of warm tones and antique pieces like an old school men’s club with this Chesterfield as the centerpiece. 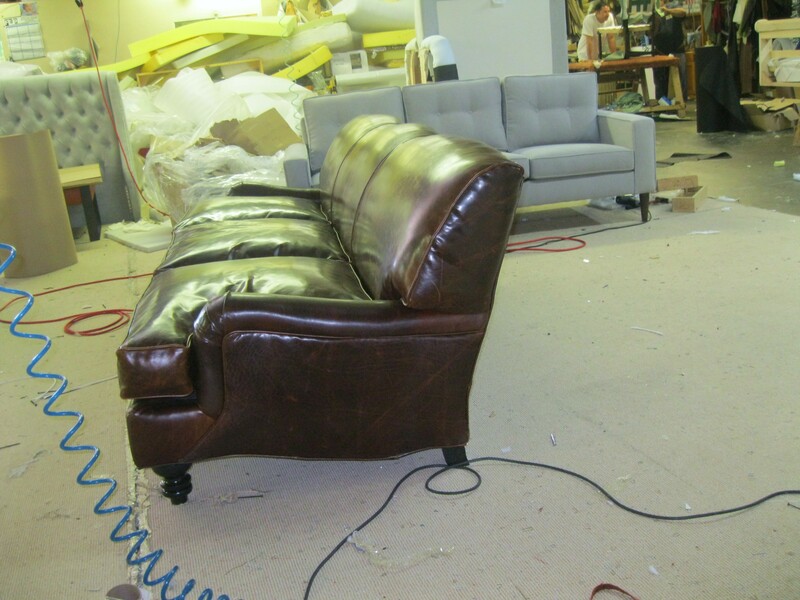 While both Restoration and Mitchell Gold offer similar sofas, they don’t offer nailheads, which take this piece from good to truly great. 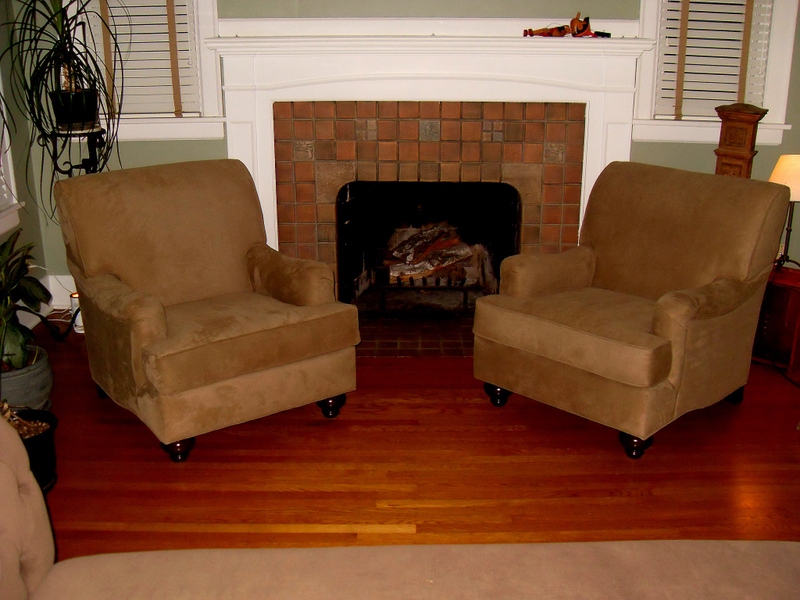 These are the English inspired chairs Chad and Chris chose to go with to complete their look. 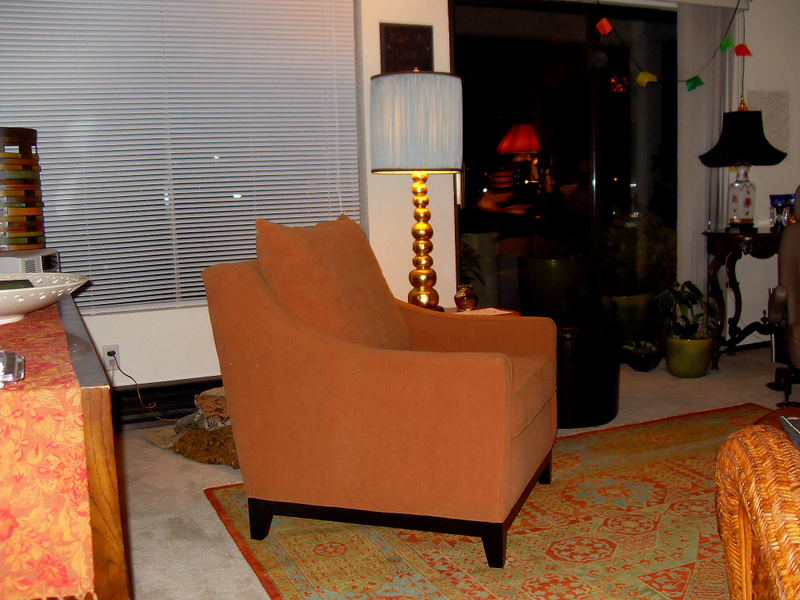 They matched the mahogany colored velvet of the sofa with this mature “peat” colored herringbone microsuede. 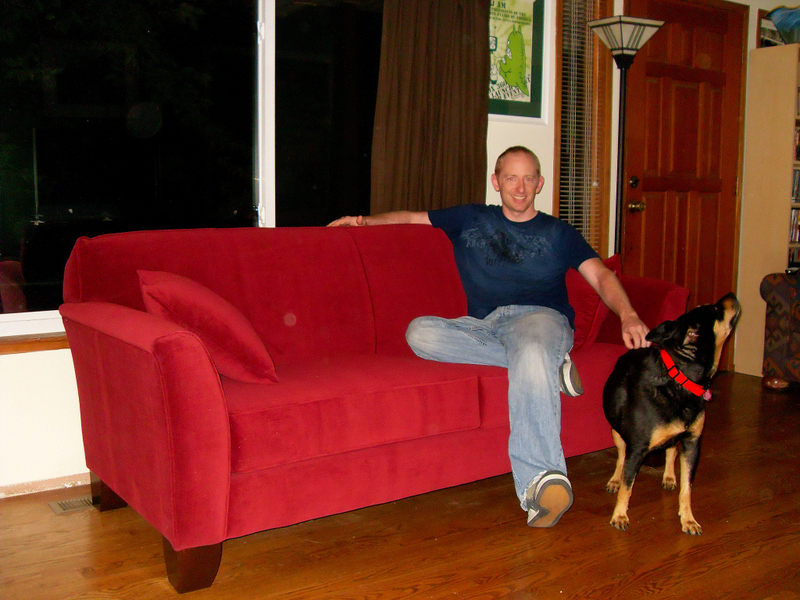 The sofa and two chairs matched fantastically well in style and color showing off Chad’s talent as an interior designer. If you’re every on the lookout for a talented local designer with an eye for detail, ask me for Chad’s contact info. Newlyweds Sarah and Val of West Seattle took delivery of their Crate and Barrel “Petrie” replica the day after they returned from their Honeymoon. They saved a few hundred dollars, had it made in a cotton rayon blend that will wear better than CBs pure cotton and Val swears mine sits softer than the CB version. That’s because I use just a tiny little bit more foam in the seat cushions. Couch delivered! 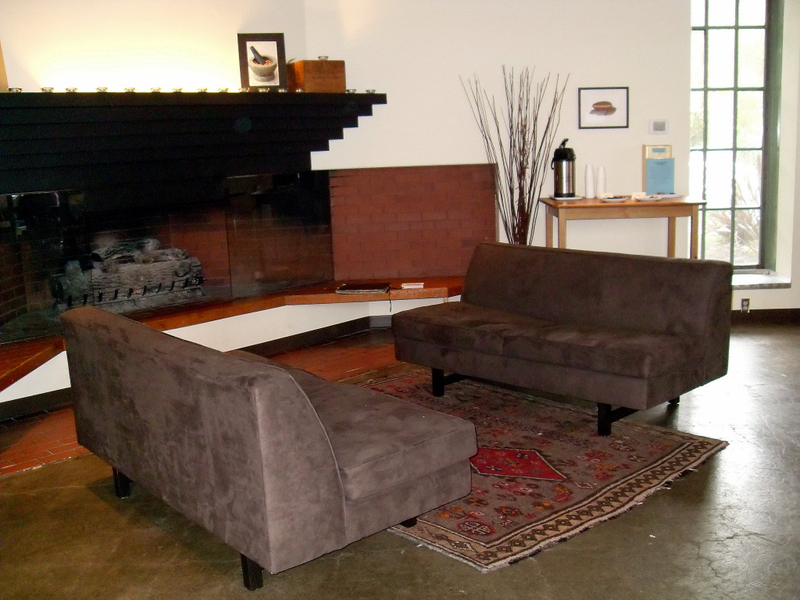 Theo Chocolate Factory needed comfortable, stylish, and sustainable furniture for their lobby. They wanted something of a specific size, and wanted to maximize seating space so went armless. The microsuede they chose is durable enough for their uber-busy shop, but still comfortable and inviting. When you’ve full flexibility, you can find the balance between beauty and usefulness. 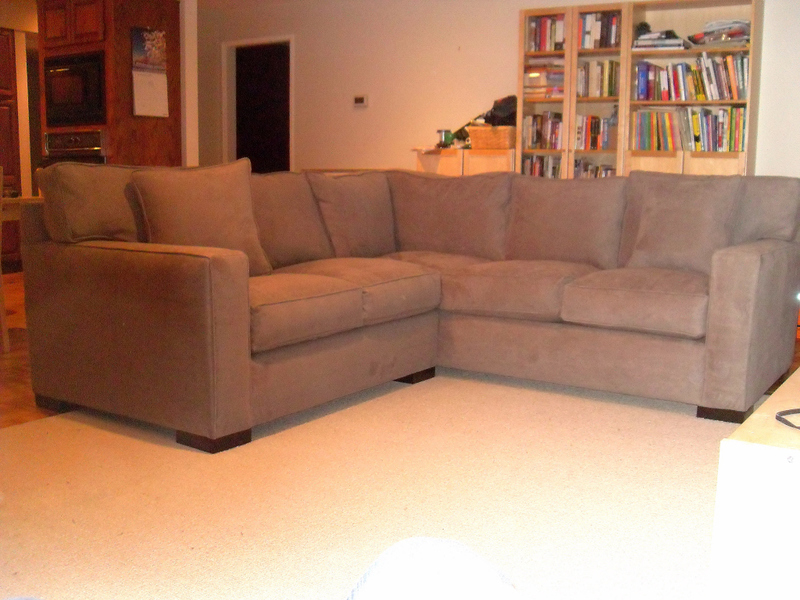 Niki of Tacoma had a very specific- and rather unique request: a double sided couch with three seats on one side and three seats on the other. The kids in her family love it she says– “it’s like a jungle gym”. There’s a few places online you can get them she said, but they cost 6k and weren’t all that nice. COUCH is hands down the only place in Seattle Niki could have gotten this. Daniel of Queen Anne wanted a small yet comfortable chair narrow enough to set his arms on either side, but didn’t want to sacrifice comfort. Only 30″ wide by 33″ deep the chair sports down fill in both the seat and back and achieved the perfect balance between a small footprint but a large comfortprint. 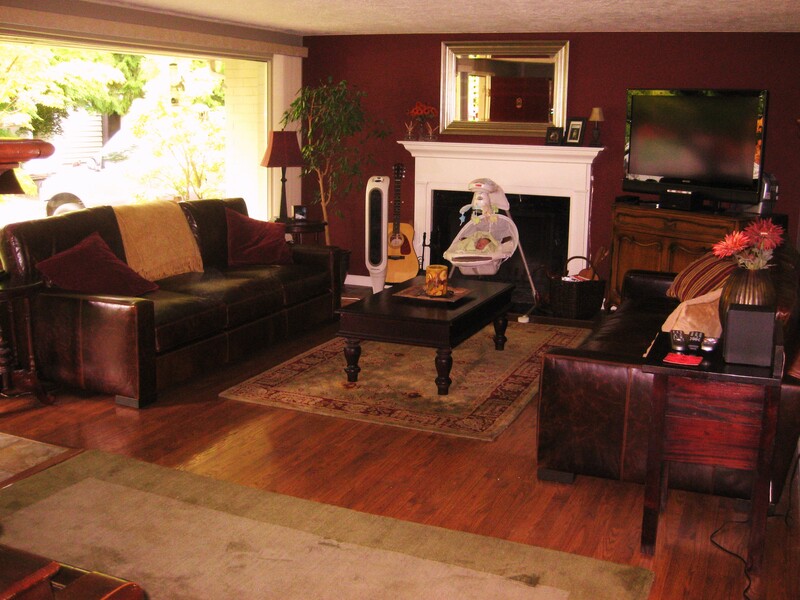 It also matches the warm taupe color in the rug perfectly. When there’s dozens of kinds of fabrics available in literally HUNDREDS of colors, that kind of co-ordination becomes possible. Tom of West Seattle (the happy looking one) lounges on his hot off the truck seating machine. He wanted a chaise that would seat six for movie night. Couch delivered! 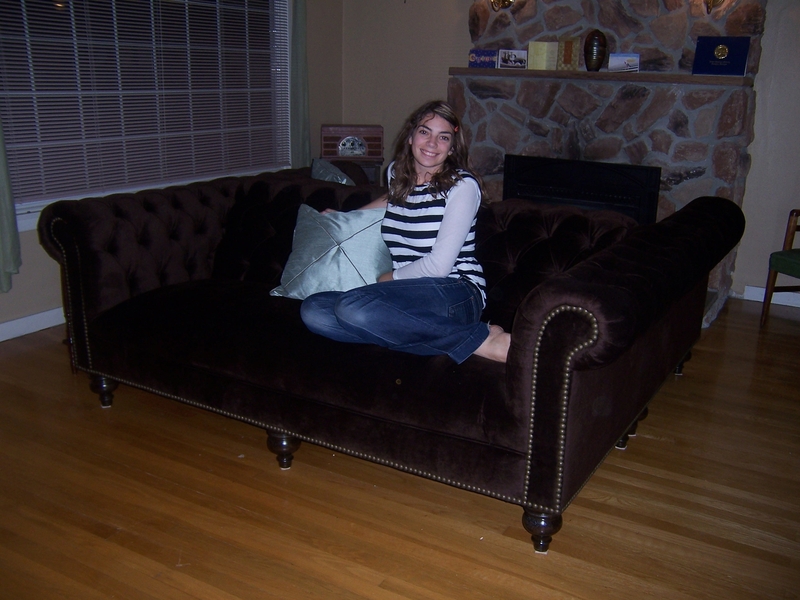 Clarissa of Wallingford looks very small on a very large couch. 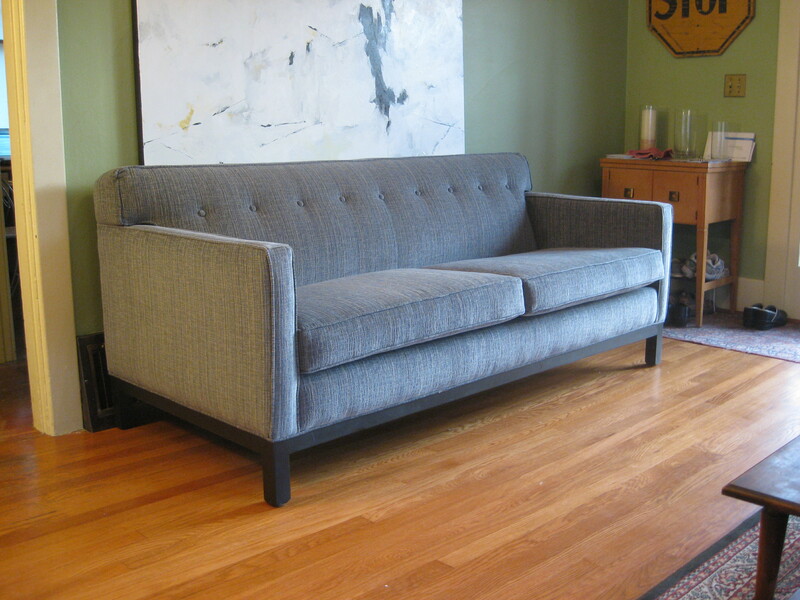 This couch looks curiously like a Restoration Hardware Delaney style. 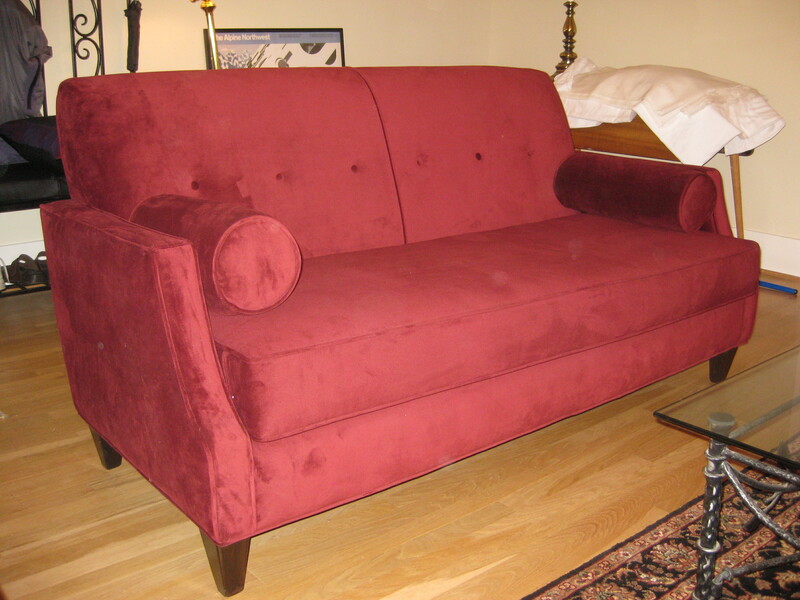 Or the identical “Jackie” from Mitchell Gold (who’s borrowing from whom is impossible to even track in sofa land) It was even delivered in the same fabric from the same mill that Restoration uses. 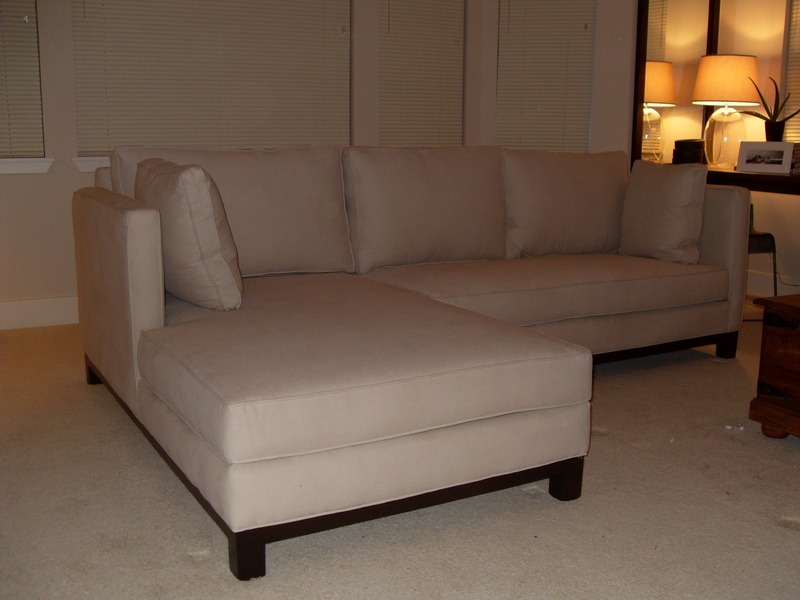 Trisha wanted a small sectional and found me after being a little underwhelmed with what Dania had to offer and a little overwhelmed by what others would charge her. This one is a truly custom piece. It’s a Crate and Barrel Hennessy at its core you see. Except they don’t make a sectional for that model. And the CB Henessy comes with an attached back. Trisha wanted loose feather back pillows so that was changed as well. There’s not much that isn’t possible at Couch! Serving up 180 different styles of couches– all built to order to fit your space.